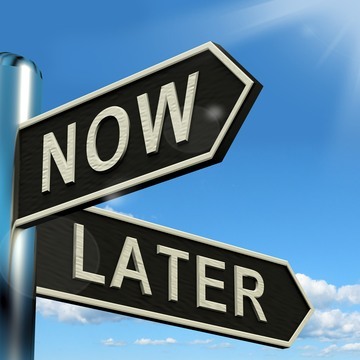 Procrastination – or the putting off or delaying of something that needs doing – is an issue which at one time or another affects us all. The lawn might need mowing, but then the rugby match on TV is not going to watch itself… the pots might need washing, but you’re nearly at the end of that good book… the application form for that new job could do with being filled in, but… you get the idea. Some items on the to do list that get pushed down the rankings are not going to cause any major problems if they are left for another day. The grass may be harder to mow if it’s a little longer, but there’s not going to be any crisis there anytime soon. Other things that we put off until tomorrow, however, we perhaps know deep down could really do with our attention. If you are quite overweight, for example, you may be mindful of the health risks associated with carrying extra pounds, but never seem to get around to doing anything about it. If you are a smoker who has been meaning to get down to the shop and buy some nicotine gum, but haven’t yet made the journey, you are aware that things need to change. Speaking personally, I am sometimes tempted to think that there is always another day on which to get on with those pressing tasks. If I am honest with myself, however, I realise that with each 24 hours that pass I am another day older, and then a week, and then a month… etc. There have been times in the past when I have realized that a full year has passed since I decided ‘to do’ something. And that’s when the unmown grass is really long and much harder to cut. Although getting the lawn mower out at this stage is tough, tackling one-year-long grass is better than facing eighteen-month-long grass, if you see what I mean. The Latin saying “Carpe Diem” roughly translates as ‘seize the day’. In the end, today is all we have, as yesterday is gone and tomorrow is not within our grasp. My counselling work at a hospice for children and young people has taught me that tomorrow is far from guaranteed, and that if something is worth doing, it needs to be prioritised and followed up soon. Is there anything in your life, on your to do list, that would benefit from being put into motion? If there is, what one small thing could you do today to start that process?